Wyatt Academy is hosting a grand opening for their brand new free-of-charge laundromat for students, their families and the entire community Friday afternoon. DENVER — As Our Colorado continues to grow, more neighborhoods are gentrifying, and in some cases families who have lived in those areas for years are seeing essential services and businesses disappear. In Denver, several local schools are stepping up to fulfill those needs. Wyatt Academy is hosting a grand opening for their new, free-of-charge laundromat for students, their families and the entire community Friday at 3:15 p.m.
“The no-cost laundromat means everything to the Wyatt community," said Director of Community Engagement for Wyatt Academy Kate Mishara. "In addition to the other resources in our Family Empowerment Center, this is a place where our families can come to get their basic needs met." Mishara said the Family Empowerment Center also includes a free boutique and free healthy food pantry. The latest addition to the center — the free laundromat — is essential because for some families, clean clothes means a hike across town to an expensive laundromat or just going without clean clothes for several days, she said. “If these machines and this space can save a family a walk across town to the laundromat and can save some coins that used to go toward laundry then that’s a beautiful thing,” she said. Third grade student Junte Sims said this will be very helpful for his family. Mishara said their hope for their new laundry room is to keep attendance up for kids with limited access to washers and dryers as well as fulfill a need in their entire community. The laundry room will be open during school hours from 7:30 a.m. to 4 p.m. and families can sign up for times to use the machines. Mishara said they are working on adding additional summer and weekend hours. Mishare said right now the room just has one washer and one dryer, but Wyatt Academy is hoping to receive additional donations to eventually expand their services. 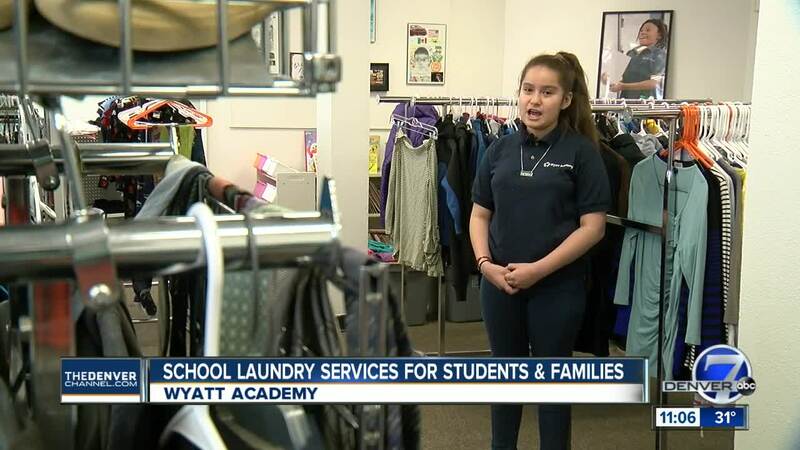 Wyatt Academy joins a growing list of schools providing free laundry service to students where the need is high. Denver Public Schools has partnered with The Laundry Truck, a mobile laundromat and serves 14 schools monthly. “There actually have been a lot of studies that show that kids attend less school of they don’t have clean clothes," said Riley Cockrell, Operations Manager of the Laundry Truck. Wyatt Academy said keeping attendance up is the ultimate goal and providing this service outside of the classroom is essential to supporting student's learning.